Our birth as a church was the fulfillment of a dream within the membership of Brookdale Covenant Church. On April 10, 1961, two members of Brookdale Covenant Church, Arthur LeVahn and Albert Rydeen, took an option on the parcel of land that our church now stands on here in Brooklyn Park, Minnesota. On April 30 the same year a Sunday School work was started in the Park Brook Elementary School, about six blocks from the site. Families from Brookdale were asked to help establish the new work. A canvas of 435 homes was conducted with some very positive results. Yes, the confirmation program at Redeemer was here from the very start, 1962. The first graduating class was taught by our interim pastor, Elder Anderson, and it was composed of two girl students, Mary Beth Shelvan and Sandy Bergstrom. The classes expanded with the growth of the church and the largest class on record was in 1989 with 35 students. From the very beginning, confirmation was recognized as an integral part of Christian education for our young people. Confirmation has become a true “spiritual discipleship” focus for every young person attending Redeemer. The three-year program was developed by one of our very own pastors who used confirmation as the basis for his doctoral thesis. It has become today a model for many Covenant churches throughout the Evangelical Covenant denomination. On April 8, 1962, ground was broken for the first unit of the church. “Faith of Our Fathers” was sung at the groundbreaking ceremony. Can you find the original cornerstone, from 1962, somewhere in the church from this first building? On April 28, 1974, ground was broken for the current sanctuary. Can you find this cornerstone? What do you imagine is inside these two cornerstones? In April of 1973, Redeemer made national news when 77 youth choir members were stranded in Belvidere, Illinois, due to a snow storm. The local Covenant congregation opened its church and hearts to our young people and housed and fed them for three days. Do you know who one of the bus drivers was for that group? That person still attends Redeemer! In May 1981, Elaine Bursch was hired to serve as the Visitation Coordinator. Elaine is still faithfully serving in this capacity here at Redeemer! Can anyone say NO to Elaine? Do you know who the previous visitation coordinator was (this person was also the first visitation coordinator)? In the summer of 1962, while the new church building was being completed, the congregation decided to have a “corn boil.” Some didn’t know exactly what that was, but it sounded like a good idea. They gathered at the home of Carl and Esther Bergstrom on a hot August evening. The perfect spot was down by the big trees just off 85th Avenue (now the Edinburgh USA Golf Course). As Carl plucked hot pieces of corn from the boiling pots and called everyone to “come and get them while they’re hot and juicy,” a tradition for Redeemer Covenant Church was born. In the summer of 1966, the cost of sending an elementary-aged camper to Covenant Pines Bible Camp was $19. Junior high camp cost $24 and senior high camp cost $25. Redeemer sent 35 campers and 10 counselors to camp the summer of 1967. In July of 1970, permission was given to hire an architect to construct the new (current) sanctuary. Don Mannstedt (then a current member) was hired as the general contractor. For several years, Redeemer held two Vacation Bible Schools: one for preschoolers and one for those in elementary school. In 1985, the average daily attendance at the preschool Vacation Bible School was 68! In the May 11, 1986, bulletin, we had games listed for six men’s softball teams. They were the Black, Gray, Green, Gold, Maroon, and Blue teams and involved 100 plus men from Redeemer. There was also a women’s team and a youth team. Good thing we had a softball field! In May of 1989, Redeemer had 32 graduating seniors in the youth group, and there were eight who graduated from college that spring. Redeemer held Sunday evening services for many years. Many special events, musical programs, missionary speakers and camp echoes were planned for the evenings. The young people in the congregation participated by singing or playing the piano or musical instruments. It was always a great time of singing and fellowship enjoyed by all ages! Throughout Redeemer’s 50 years, we have held a fall kick-off event to bring our people together again after a busy summer and to feature upcoming programs. That is certainly one of the purposes of our Annual Corn Boil, and we just celebrated the 47th of these gatherings last month. But do you recall the history of our Homecoming Celebrations? On Saturday, September 9, 1989, Redeemer held its first Homecoming festival. It was a day that overflowed with laughter and fun: around the dunk tank, the water balloon launch, the Five Guys in Top Hats, the “jail” that had unusual bail requirements (ask Jeff Bursch what song he had to sing to get out). The day was capped by a parade complete with Grand Marshalls (Pastors) Fenton and Bromstrup, kids on decorated bikes, the Lawn Chair Drill Team, and the Redeemer Church Band. This event served to bring unity and strength to our congregation and to remind us of God’s great love for us at a time when we were transitioning through very difficult circumstances. The 1990 Homecoming added comedian, mime, and storyteller Bob Stromberg, to our line-up of fun. In 1991, Homecoming was combined with the Corn Boil for the first (and last?) time and the theme was “A Place for You.” Ensuing years brought Homecoming Sundays. Typically, Sunday School promotion activities would precede an outdoor service that might feature a gospel group like the Chancellors, other special music, or a guest speaker. Redeemer still celebrates a homecoming on the first Sunday after Labor Day: in 2009 it was called Kick-off Sunday, last year it was Next Step Sunday, to begin our series in the book by that name. Regardless of how we have celebrated the beginning of a new season of worship and service at Redeemer through the years, the aim has been for each of us to feel like there is a place for us, that we are coming home. In October 1975, the Redeemer phone prayer chain was organized under the leadership of Priscilla Thompson, a member of Redeemer. In the early days, those on the prayer chain were instructed to write the prayer request in their notebook, call the next person on their list (if no answer, call the next person on the list) and read the request to them. How much easier to just check your e-mail! On Sunday, December 13, 1971, Don Gustafson, husband of Dorothy Gustafson (our first parish worker), passed away unexpectedly. The Memorial room was dedicated in his memory. All the memorial money was used to build and furnish the room which is now used for Sunday classes, training meetings, wedding showers, staff meetings, ESL tutoring, etc. On Sunday, December 8, 1974, the new sanctuary of Redeemer was dedicated. In the old sanctuary (current choir room), four people presented thoughts about the church: Cindy Hallblade, Gary Bergstrom, Dorothy Rogers and Jim Busse. 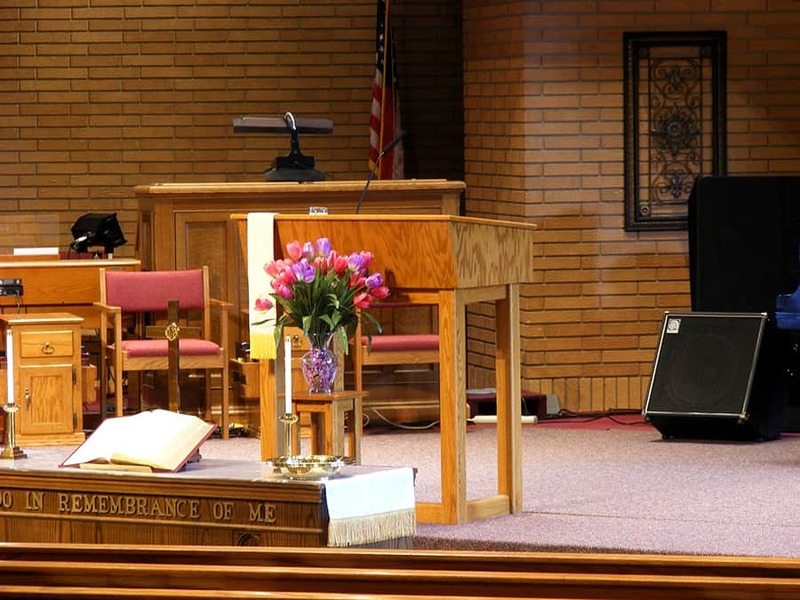 Carl Bergstrom, a charter member, sang “Thanks to God for My Redeemer.” Then the congregation quietly moved into the new sanctuary to continue the service. On December 10, 1978, the play, Christopher’s Miracle, was performed. The play received front-page prominence in the Brooklyn Park Post and featured Dan Bachmann, son of Jim and Mary Bachmann, as Jesus. Leading actors were Wendy Erickson, Michelle Bursch, Dwight Erickson, Sally Magnuson, Steve Hallblade, Linda Eng, Barry Anthony, and Kim Lokhorst. Our pastors wrote the play. In January 1977 our first Associate Pastor of Youth, Larry Magnuson,was hired. Larry brought a wealth of ideas to this position. Under his leadership, children’s church grew and a puppet ministry and drama program were launched. Later, Larry became Senior Pastor at Maple Grove Covenant Church. He now resides in Colorado and is Director of Son Scape Retreats. For many years in January, Redeemer held 24-hour prayer vigils. Participants came—as singles, couples or families—to the Memorial room, where refreshments and the warmth of the fireplace helped provide a welcoming, quiet environment for coming before God. The pastoral staff was assigned to 8-hour shifts, and members of the congregation were asked to sign up to pray for 30 minutes. Prayer concerns were provided and personal prayer was encouraged. On January 21, 1990, a welcome program was held for Pastor Tom, Pat, Jenelle and Joel Johnson. They arrived here from Des Moines, Iowa, and were returning to Minnesota, having served in Little Falls earlier in Pastor Tom’s career. Through the next fifteen years, Pastor Tom’s ministry helped provide healing and stability to a congregation that had been undergoing much adversity. In January of 1991 the Redeemer congregation voted to change our governance format from Board/Committees to the Council/Commissions. This change was done in order to provide a more efficient organization that also more closely reflects the biblical model for Elders and Deacons. Every February, our youth group has gone to a camp for a winter retreat. In the early 1980s, a memorable retreat was held over Valentine’s Day. Cupid (Greg Black) and Stupid (Greg Olson) charmed all those in attendance with their antics and skits about the older counselor couples. Greg Olson remembers that his costume was a red union suit and white shorts while Greg Black wore a white union suit with red shorts. A memorable event from the 1981 youth retreat was when Jeff Fjeld cut the power to the 8th and 9th grade girls’ cabin. What was really distressing to the girls was that, as a result, they had to come to breakfast without curling their hair. HORRORS! And some kids are wondering if Elsie Johnson and Jan Lokhorst ever found their mattresses from that retreat. Ten years ago, a special visitor who came to the 2002 Taste of the South dinner was Sergeant Major Al McMichael, the first ever black Sergeant Major in the Marine Corp. He spoke to the congregation about the war in Iraq and the effect it was having on our American soldiers. It was his talk, along with 9/11, that influenced Pastor John Anderson to return to the military later that year as a Chaplain. March 4, signing the charter: If Redeemer had an official birth date, today would be the day! This is the day we have been celebrating the past year. Fifty years ago today, forty-four signatures were set down on our organizational charter. On that Sunday, we still didn’t have a name. 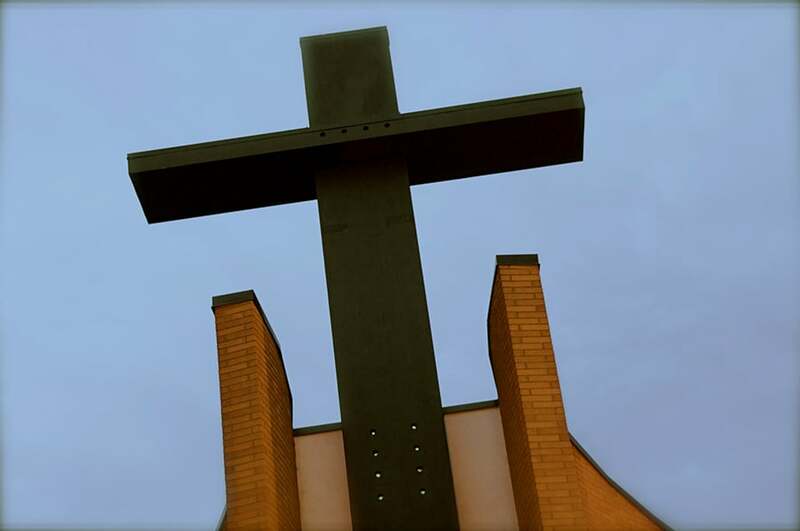 “Redeemer Covenant Church” was chosen three days later, on March 7, 1962. Starting out as a new church, hardly anything was new! Office and kitchen equipment, carpet, cubicle partitions and even the light pole out front were commandeered from Honeywell by Bert Johnson and Arne Stohlberg. Little children’s chairs were given by a school, refinished, and are still in use today. On March 26, 1962, we broke ground for the parsonage on Tessman Drive (just north of the church). Two years later, on March 31, 1964, Paul Johnson, Bert and Elsie’s baby boy, was the first to be baptized in the new church.